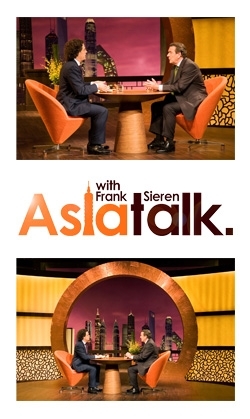 Deutsche Welle-TV, Germany’s international broadcaster at the heart of Europe, is now airing programs from Asia for Asian audiences: “Asiatalk” is the name of a new talk show produced in Beijing which profiles the growing challenges of globalization. DW-TV is unveiling a new talk show tailored specifically to audiences in Asia. Every week, host Frank Sieren will be inviting guests to his panel discussion who have special dealings with Asian countries. Plans are for eight German-language editions and eight in English, broadcast on the DW-TV ASIA+ and DW-TV ASIA channels. Partners! But how? Dealing in a clever way with the future world power China. Frank Sieren hosts German Ambassador to the People’s Republic of China, Dr. Michael Schaefer. How do Asians interpret Beethoven? Is music really a universal language? Frank Sieren hosts Justus Frantz, the famous German conductor. Peking Opera: Is there a hidden beauty? Frank Sieren hosts Ghaffar Pourazar, the only foreigner who really knows how to perform Beijing Opera. The world economic crisis is not over: How top executives and governments should act differently. Frank Sieren hosts Europe's leading Management Scholar and Consultant Prof. Fredmund Malik. China Online. The web changed China. Is China now changing the WorldWideWeb? Frank Sieren hosts Victor Koo, one of the leading Chinese Web Tycoons. Disagreeable partners. How patient should we be with authoritarian states? Frank Sieren hosts the former German chancellor Gerhard Schröder.